Below are common attributes associated to Box Leaf Holly. Become a care taker for Box Leaf Holly! Below are member comments regarding how to plant Box Leaf Holly. No comments have been posted regarding how to plant Box Leaf Holly. Be the first! Do you know how to plant Box Leaf Holly? Below are member comments regarding how to prune Box Leaf Holly. No comments have been posted regarding how to prune Box Leaf Holly. Be the first! Do you know how to prune Box Leaf Holly? Below are member comments regarding how to fertilize Box Leaf Holly. No comments have been posted regarding how to fertilize Box Leaf Holly. Be the first! Do you know how to fertlize and water Box Leaf Holly? Below are member comments regarding how to deal with Box Leaf Holly's pests and problems. No comments have been posted regarding how to deal with Box Leaf Holly's pests and problems. Be the first! Do you know how to deal with pests and problems with Box Leaf Holly? Looking for Box Leaf Holly? Get Helleri Holly fresh and large directly from the grower to your garden! Buy Helleri Holly online from the nursery wholesalers and save BIG! 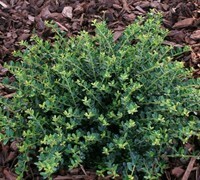 Plant Helleri holly in well-drained soil in either full sun or partial shade. Consistently wet soils can cause problems with the roots. Helleri holly is a very low maintenance plant that requires no pruning however responds well to it. Can be sheared to various formal shapes or as a low hedge. Helleri holly prefer an acid soil with a pH in the range of 5 to 7. I fertilize hollies in spring and again in late summer with a well-balanced shrub & tree type fertilizer that includes a micronutrient package containing iron and/or sulfur. If the foliage on your holly develop chlorosis (yellowing of leaves), due to soil that is too alkaline, you can apply additional amounts of chelated iron and/or soil sulfur to lower soil pH, making it more acidic. Helleri holly is a very tough plant that has very few insect or disease problems. Consistently wet soil can cause serious problems with the roots.